The rocket, carrying no people on board but eight science experiments for NASA, soared skyward from a launchpad in west Texas at 1508 GMT against a clear blue sky. A few minutes into the flight, the capsule separated as planned from the booster and reached its peak height of 66 miles (106 kilometers). "That is exactly what we were targeting," said Ariane Cornell, an astronaut for Blue Origin and commentator on the company's live webcast of the launch. The frontier of space is internationally agreed to be 62 miles (100 kilometers) above Earth, known as the Karman Line. Eight minutes after blast off, the rocket booster fired its engines and made a controlled, upright landing back on Earth, marking the fourth flight for this particular rocket, and the 10th flight test for New Shepard overall. "That, everybody, is a reusable rocket," said Cornell. Moments later, the capsule floated to Earth, aided by a trio of parachutes, and touched down in a cloud of dust. The entire mission lasted 10 minutes, 15 seconds. "Looks to have been a wholly successful flight today," wrote Blue Origin on Twitter. "We are aiming for the end of this year," Cornell said. "We are not in a rush. We want to take our time and do this right." The passenger capsule is "roomy," Cornell said, with six seats and six "big gorgeous windows." The price per ticket has not yet been announced. 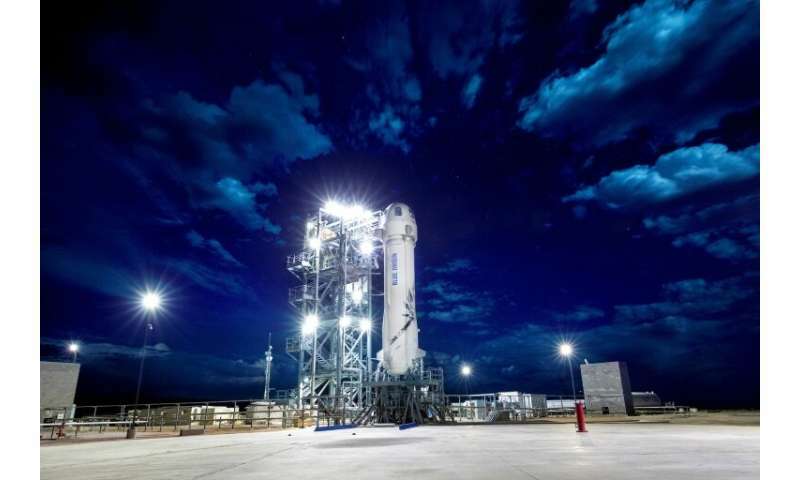 The New Shepard rocket first reached space last year, achieving a height of 66 miles in April 2018. On December 13, 2018, Virgin Galactic's SpaceShipTwo, VSS Unity, flew higher than it ever had before, surpassing what the US Air Force considers the boundary of space (50 miles), and marking the first manned flight to space from US soil since 2011. The brief flight—with two pilots on board—was a key milestone for the Virgin Galactic, which is striving to send tourists to space at a cost of $250,000 per seat. Let's see the refit level and time period and expense level for that refit --data. Then we can be the judge of it really being a reused rocket or not. Musk, Branson, and Bezos have been puffing this up for a while now. After seeing Musk's test prototype revealed as fake and blown over by the wind in a pile of its own crumpled cardboard, I'll withhold my jubilation until one of them actually starts doing it rather than testing it.